England's latest lacklustre effort is set to be buried under a wealth of coverage granted to their footballing counterparts who make their Fifa World Cup bow later today - and it is probably the best place for it after another frustratingly limited showing. Martin Johnson's charges were not short of power and outmuscled their hosts time and time again at scrum time but it was always going to take more than that to beat the Wallabies. Sadly, England had very little else to offer and were once again bereft of ideas in attack and all too eager to kick the ball away to an ever-appreciative Wallabies backline. In contrast, Australia were a joy to behold - in attack at least. The worryingly inexperienced front row fielded by coach Robbie Deans was, as expected, found wanting against their English rivals - conceding two penalty tries under immense pressure. But their hugely-talented back division saved the day - led by the undoubted talents of fly-half Quade Cooper who orchestrated proceedings on his way to the man of the match honour. He was ably supported by scrum-half Luke Burgess, wingers Drew Mitchell and Digby Ioane and fullback James O'Connor who together tormented England - breaking the gainline at will. Pace and power will forever be a deadly mix and Deans has an enviable talent pool at his disposal. Now if only he can bring his front row stocks up to the same standard - without their first choice options in that department they were quite simply out of their depth. As an attacking force, Australia looked dangerous throughout and were full of invention and perhaps more importantly confidence - given the freedom to play. Such a free-flowing, counter-attacking approach remains a dream for an England side who so often appear to have left the hand-brake on and are almost scared to throw caution to the wind for fear of failure. This is of course, not a new problem for this current crop of England players. The brief glimpses of expansive rugby shown in this year's Six Nations are an ever-more-distant memory. The only time England had their fans on their feet in Perth was when they were forced into a counter-attack - and the fact that the length of the field move ended with a try albeit from a scrum should resonate loud and clear with the England management. "The kind of dominance they had up front is the sort of platform coaches dream of so you can understand the frustration of Johnson and co at their failure to complete the job." Putting the performance to one side, this was a great opportunity for England to end a losing run in the southern hemisphere dating back to that famous day in 2003 when they lifted the Rugby World Cup and was also a chance to lay down a marker ahead of next year's showpiece across the Tasman in New Zealand. A victory would not have papered over all the cracks but would have shown that this current England side have what it takes to beat the best on their own patch - at present, they quite clearly don't have the all round game to do that. The kind of dominance they had up front is the sort of platform coaches dream of so you can understand the frustration of Johnson and co at their failure to complete the job. But their creative shortcomings were only part of the story with a woeful 30-plus missed tackles more the stuff of nightmares. Johnson will be the one losing sleep in the week between now and the Sydney re-match. Johnson's reputation continues to take the kind of hammering his front row stars dished out in Perth. He can boast just eight victories from 22 matches since being appointed - a record worse than that of his predecessors Brian Ashton and Andy Robinson and you may remember they were then shown the door. 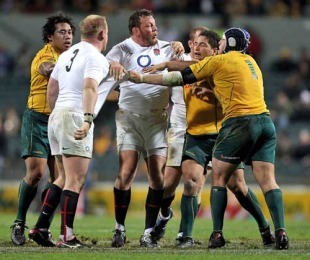 The Rugby Football Union refuse to enter into a debate as to Johnson's future insisting he will lead England to RWC'11 but their hopes for that tournament must nose-dive a little more with each fruitless display from their side. How envious Johnson must be of Deans whose young side look increasingly assured. He has ridden a storm or two himself since taking the Wallabies' reins in 2008 but he has come through the other side. His side have long been tipped for a strong showing at next year's World Cup and that faith will only grow stronger with performances like this. We have never questioned the talent within this crop of rising stars but they showed the kind of courage and bravery in Perth that will also be needed if they are to lift the sport's biggest prize. Question marks remain up front but this bruising experience will enhance the rugby education of the likes of Ben Daley, Salesi Ma'afu and Saia Faingaa. With Australia's front row injury woes set to continue this week there can be little doubt about how the game will play out up front next weekend but all eyes will be on the backline battle. Will Australia, bolstered by the return of playmaker Matt Giteau and a fully fit Will Genia, hand England another lesson or will the tourists conjure a highly unlikely turnaround in their attacking fortunes? Only time will tell and for both teams that game cannot come quick enough.